Perfect for any pint-sized entrepreneur, the Lemonade Stand will provide kids hours of fun. 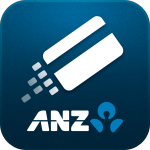 A fantastic imaginative learning tool, any child will love to play shop in this iconic symbol of childhood. This stand is more than just a toy, it is also a great way for children to develop social skills and coordination while encouraging them to use their imagination. Suitable for use both inside and out, this stand is easy to assemble with a sturdy plastic frame and durable cotton canvas body. Designed to last and withstand the rough and tumble of everyday play, this stall will have kids building their lemonade empire in no time. Let your child get lost in imaginative play with the Lemonade Stand. This bright stall invokes all the fun of a makeshift lemonade stand in a reusable play tent. 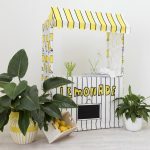 Featuring bold white, lemon yellow and black colours in a wooden stall design (complete with a super cute awning), it is the perfect companion to rainy days and school holidays. Encouraging children to use their imagination, kids can play shop making transactions and serving lemonade or other items. This kind of play not only develops necessary social skills but also can be utilised as a way to foster literacy and numeracy learning.